How Quickly Life Can Change! I suspect that most of you who know me and KT Miniatures well, had wondered why I have been so quiet of late and why very little has been added to the website recently. Much of my time since the last blog posting was put up has been spent at hospital with Mr KT Miniatures, who has been very poorly indeed. Last week I had the misfortune to experience my first ambulance ride ever and sincerely hope I never have to do that again! (I swear I have more grey hairs than this time last week...ha ha)! I will spare you the graphic details but I still shake at the knees just at the mere memory. Am happy to say that he is back home today and am now multi tasking as I delve back into the wonderful world of miniatures, but this time with my nursing hat back on. Please note that I may well have to close earlier than normal before Xmas - at the moment I am estimating 13th December...so it is advisable to place your orders sooner rather than later. I have some beautiful miniatures to put up for sale and will highlight some of them on here, when they have been listed over the next few days. 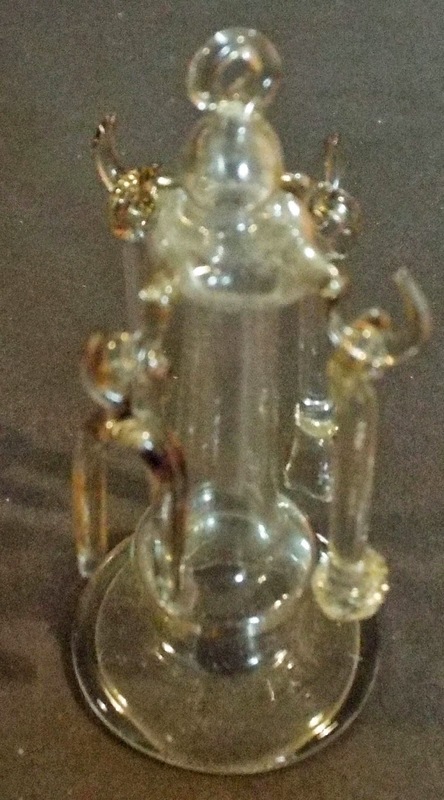 Some Beautiful Miniature Irish Glassware....Stunning! 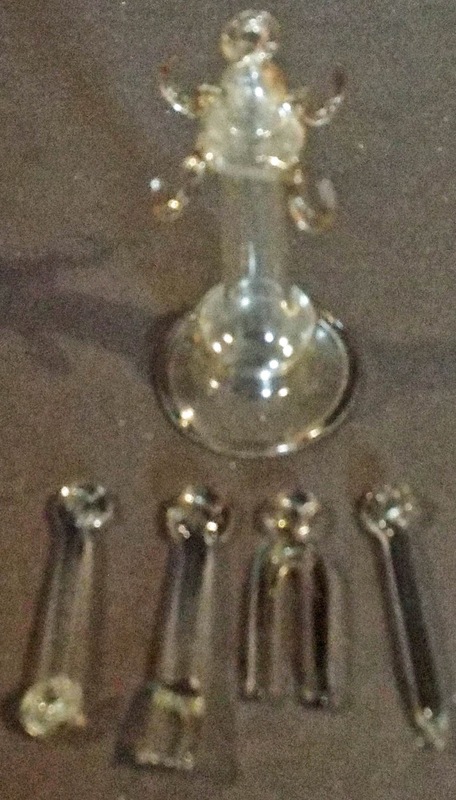 Just put up for sale yesterday was some gorgeous old miniature glassware, all over 50 years old and all were purchased in Ireland just after WW2, over a period from 1947 to 1952. This has to be one of my favourites...it is truly delightful and stands at a height of 2 1/4" high. 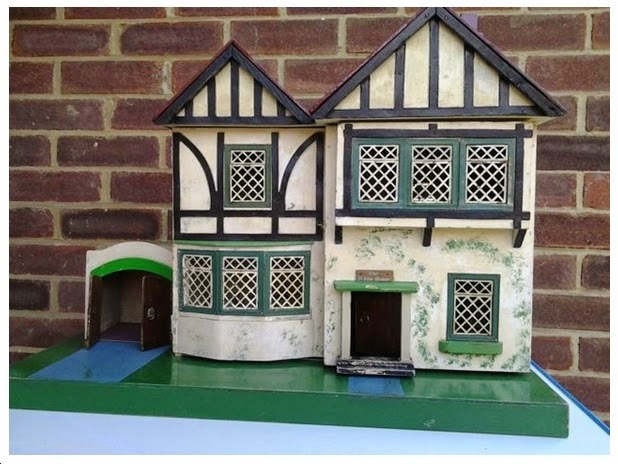 It would look rather splendid in a vintage dolls house, either 1/12th scale or in an old dolls house where scale does not matter. The little orange tips gives the impression that this is lit.....exquisite! 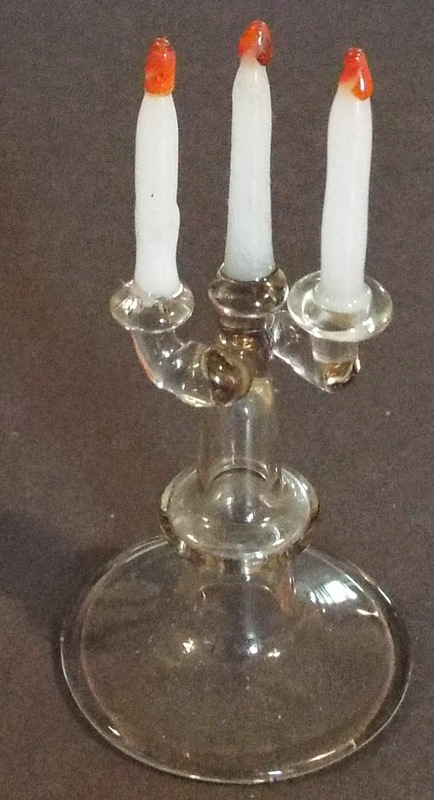 Then there is this all glass fireside companion set, complete with stand and four tools. I have never seen anything quite like this before. 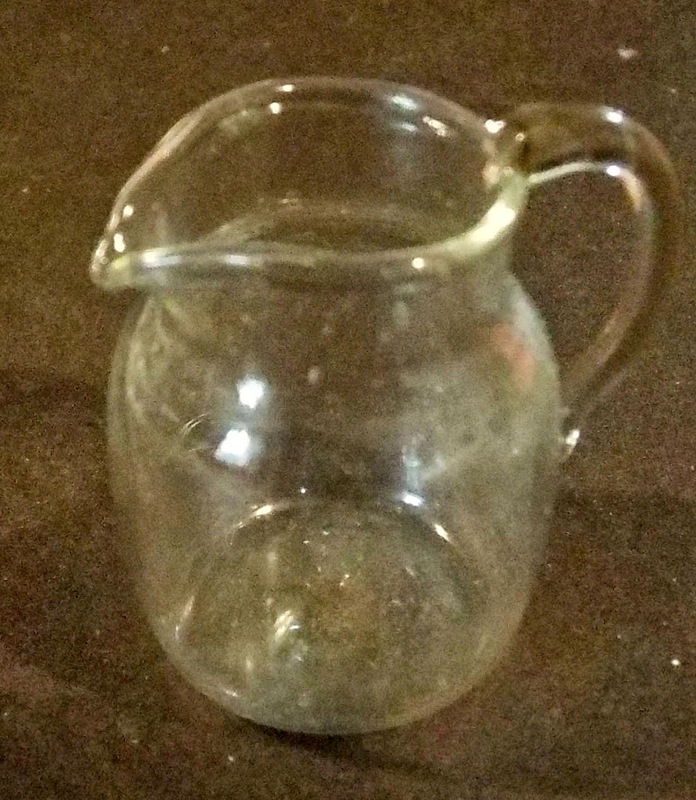 It is also believed to be Irish Glassware. I found this so difficult to photograph as I kept getting a reflection each time I had a go....sorry but this is the best I can do....the photo simply does not do this justice. 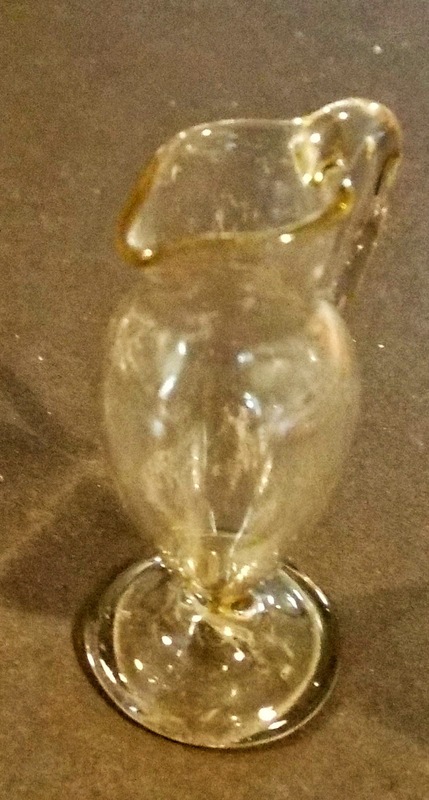 It is amazing how the previous owner took such great care with this glassware, considering she was given this as a child. 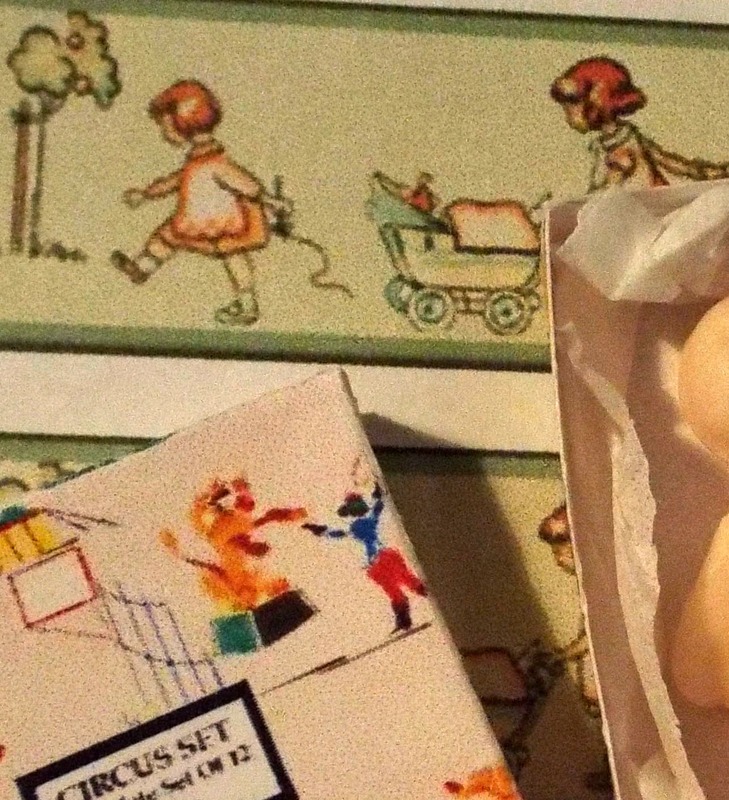 She told me that she was given all these by her father between the years of 1947 and 1952, as he used to visit Ireland a lot on business back then and each time, would bring her back something for her dolls house. 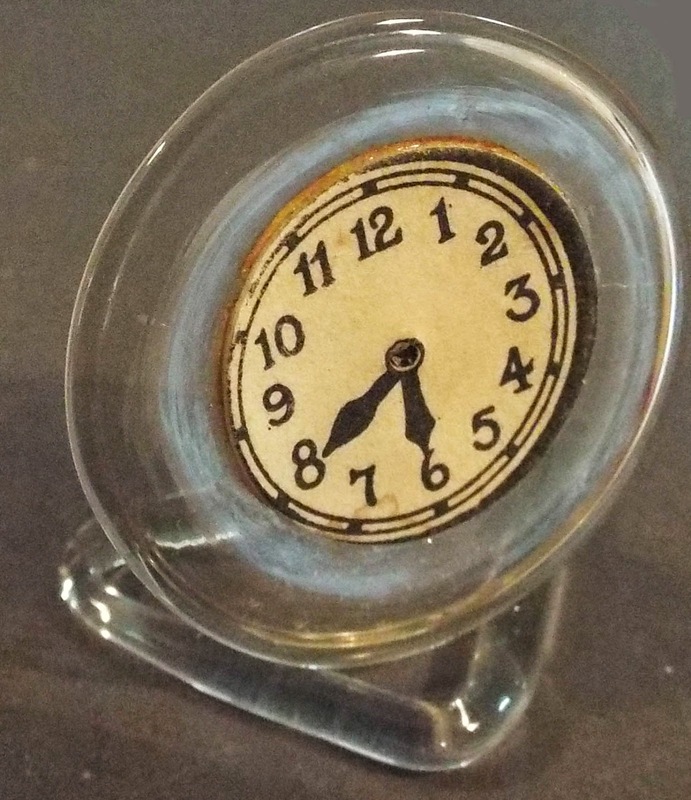 Now this glass clock with paper dial is fascinating....simply because Dol-Toi used to sell these but they were made by another company, which is unknown. 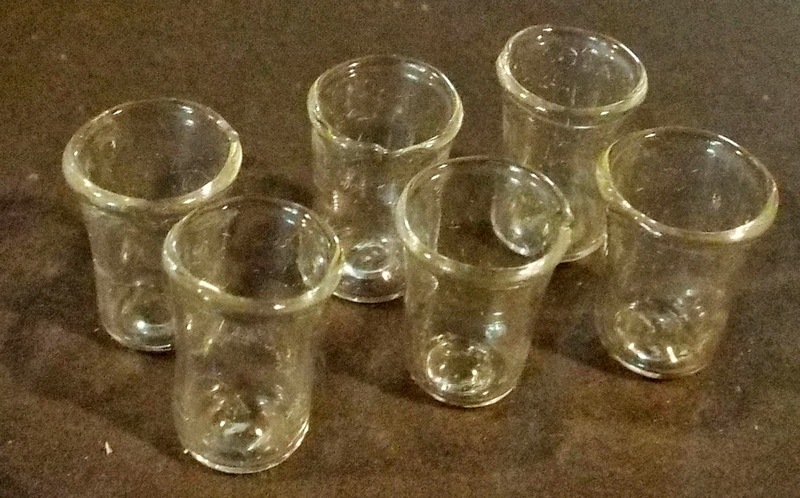 So...I wonder if the glass company was Irish...who knows? But I love this little clock, is so stylish with the tubular triangular glass base.....again, this is exquisite. 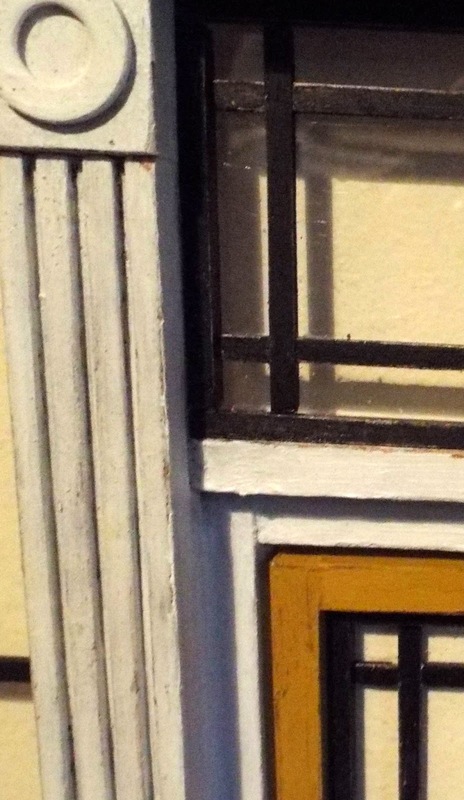 So basically we will be making an authentic 1/12th scale replica of a late 1800s/early 1900s miniature shop in true antique/ vintage dolls house style! 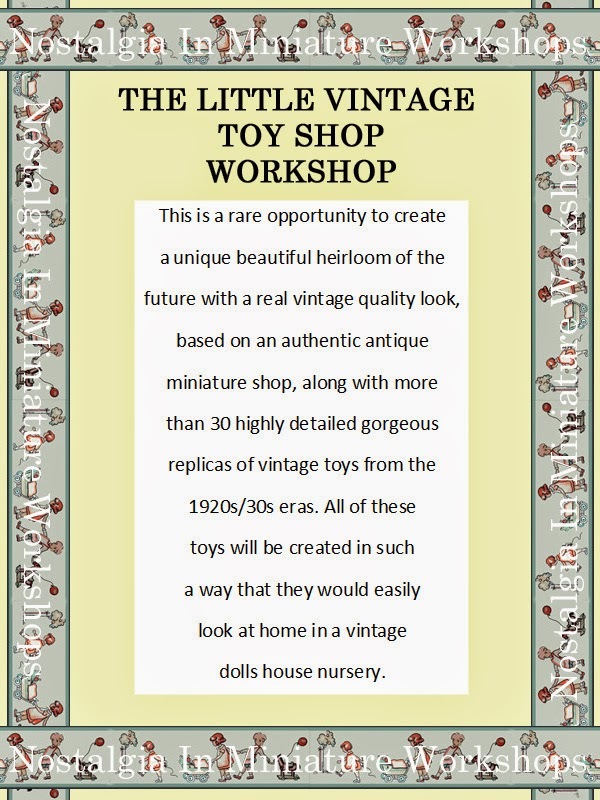 We decided to interpret this project as a vintage toy shop, and included with this project will be materials and instructions to make over 30 quality toys based mainly on the later era of the 1920s/30s. 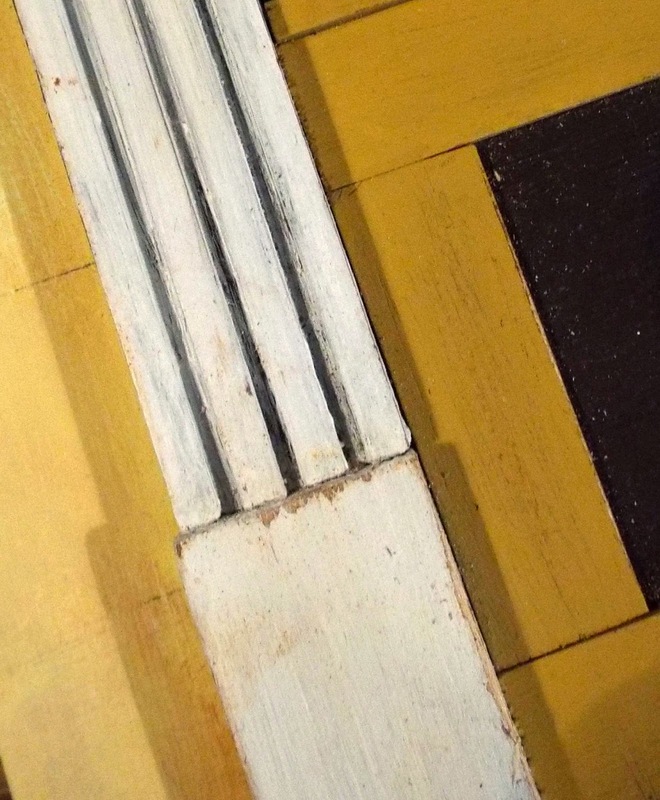 Painting techniques and some of the constructional methods used in this project are the same used in dolls house restoration, so for those of you who are very much into antique and vintage dolls houses, this particular project may have added interest to you. 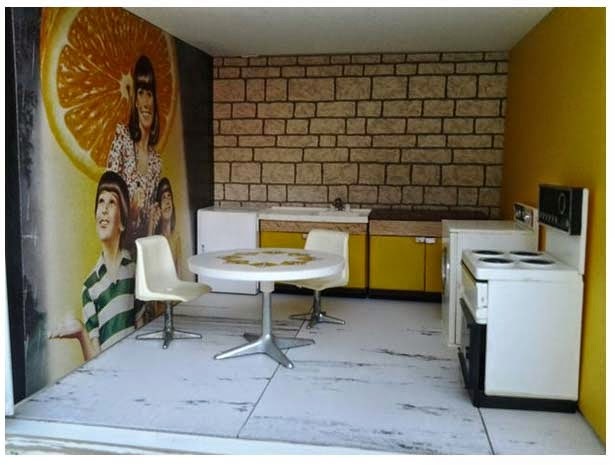 You will have an opportunity to embellish your shop front and we will show you how to make your shop look decades old....great fun! With the combined skills of both my workshop colleague Robin Britton and myself we have produced a very different kind of workshop project this time...we hope you like it. 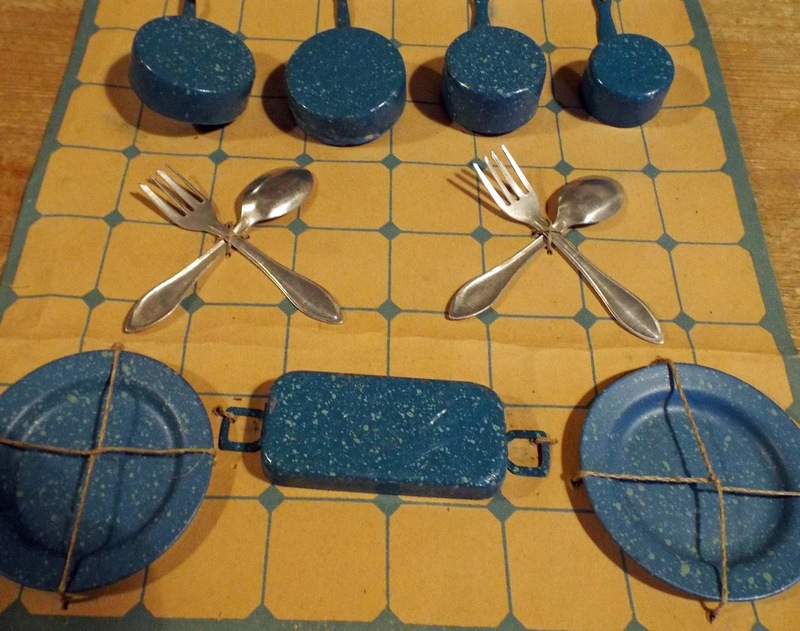 Some of the toys will blow your socks off...but yes, you can make them too! Take for instance, this replica of a 1930s toy Tri-ang laundry set including mangle! 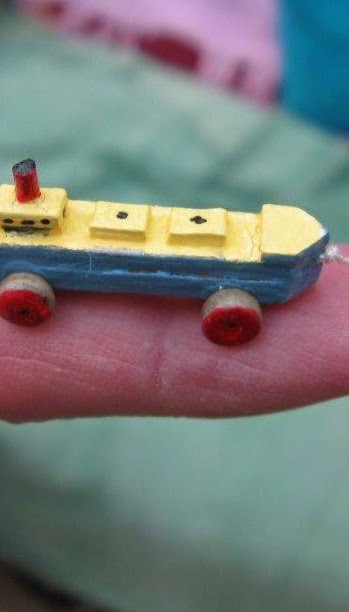 Or how about this weeny pull along miniature boat on wheels...photographed standing on Robin's finger! Then there is this tiny little train. The materials used for many of these toys will amaze you...not quite what you'd expect....but then, we love to turn ordinary everyday materials into beautiful miniatures! 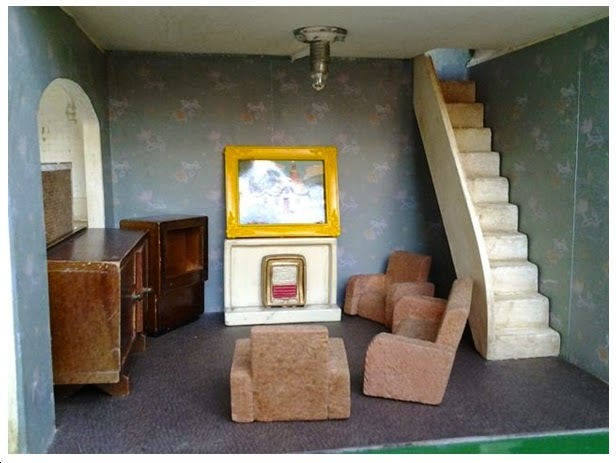 Many of these toys would most definitely look quite at home in a vintage dolls house nursery, so if you are a vintage dolls house enthusiast and have never been to one of our workshops before...why not give it a try? We are aiming to run this all day workshop at our Bicester (UK) venue once more, on a Saturday in June 2015 but are not able to confirm the date until January 2015, due to the venue's booking restrictions. So meanwhile, we are operaing a RESERVE LIST. If you would like to add your name to this list so that you can be offered a priority place before booking goes live on the website in January, please do get in touch asap. The promotional page is now up live on our Nostalgia In Miniature Workshops website, and as we get more photos, they will be added to that page. 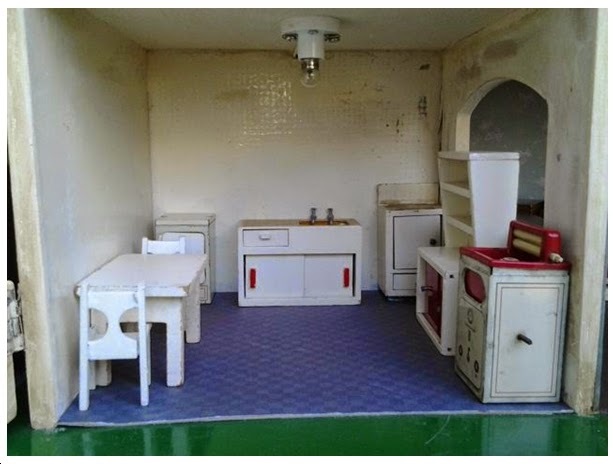 Even though this French toy kitchen set was sold as soon as it went up for sale the other day....I thought it was worth highlighting on here, as I have never had one of these in at KT Miniatures before. 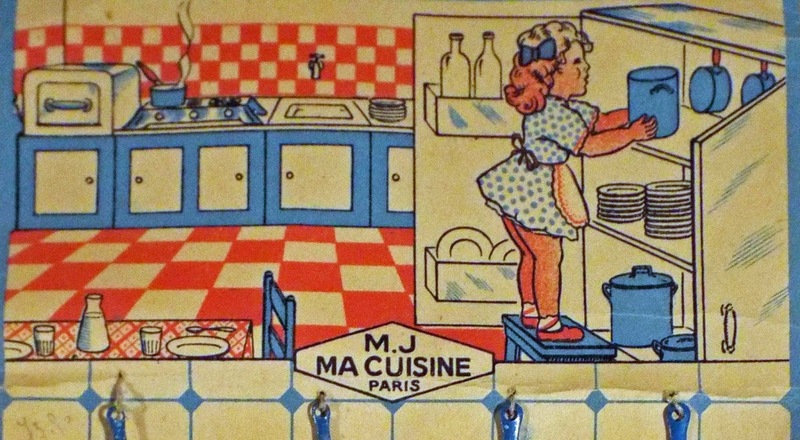 Marked M.J MA CUISINE - PARIS, it is probably more like a dolly size but would suit a large scale old dolls house or an old dolls house where scale doesn't matter. 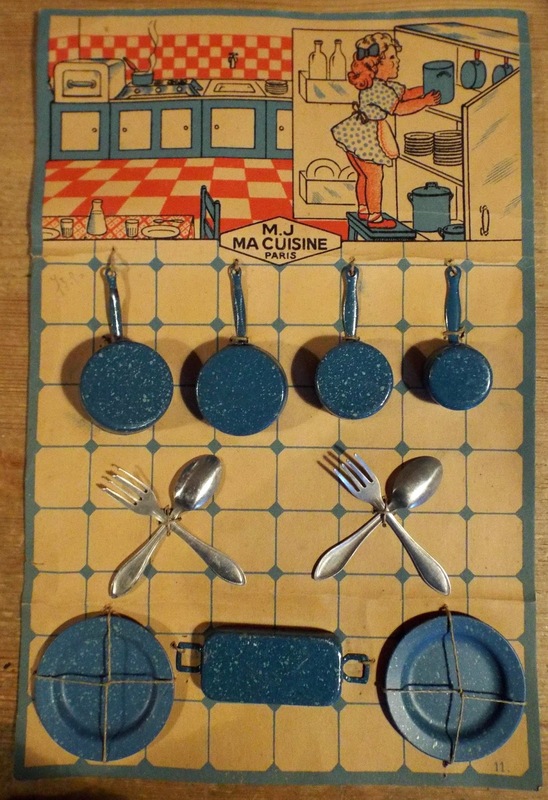 I suspect that it originated from the 1950s and is in fantastic condition, as the mottled blue painted metal kitchenware is still attached to the display card, therefore has never been played with. The plates measure 2 1/8" in diameter, the cutlery measures 2 3/4" long and the biggest saucepan measures an overall length of 2 3/4". So quite big! I had even considered framing the whole thing in a box frame and hanging it on the wall in my kitchen, but hubby was not impressed with that idea..ha ha! 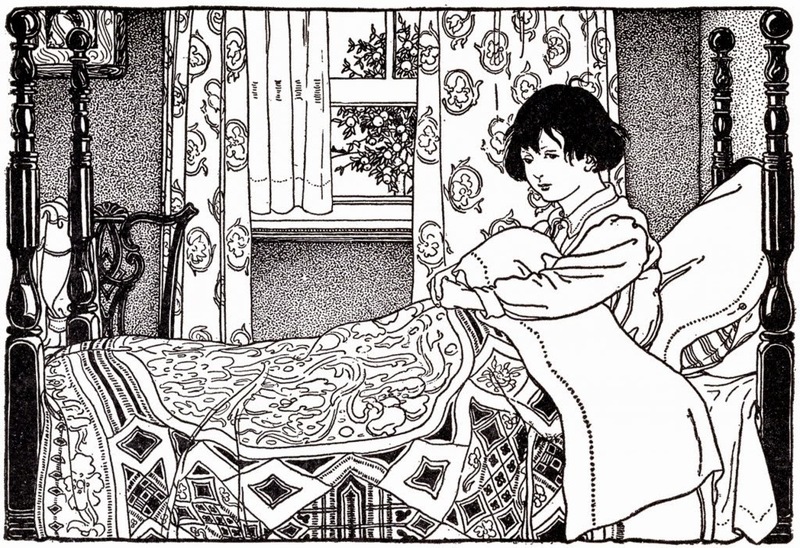 The illustration of the little girl standing on a stool, reaching up to take a pot out of the kitchen cupboard, is charming and gives an interesting insight into kitchen style of that era. A delightful nursery paper image with what appears to be a Turkish flag fixed to the flat side....very unusual indeed! 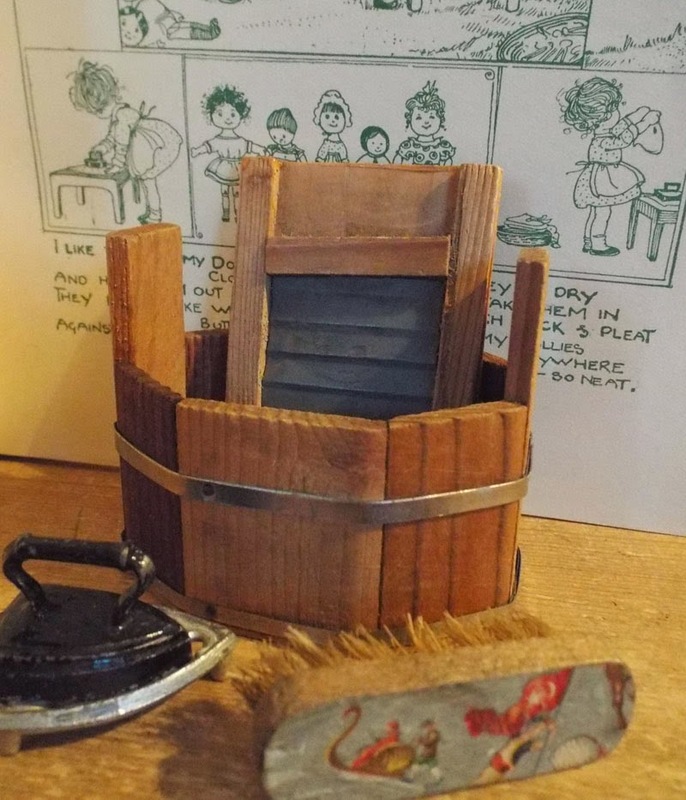 There are also some large scale laundry items such as a wooden washtub with metal strips around the outside, a quirky mishapen wooden and metal washboard plus a heavy metal flat iron with decorative metal stand. 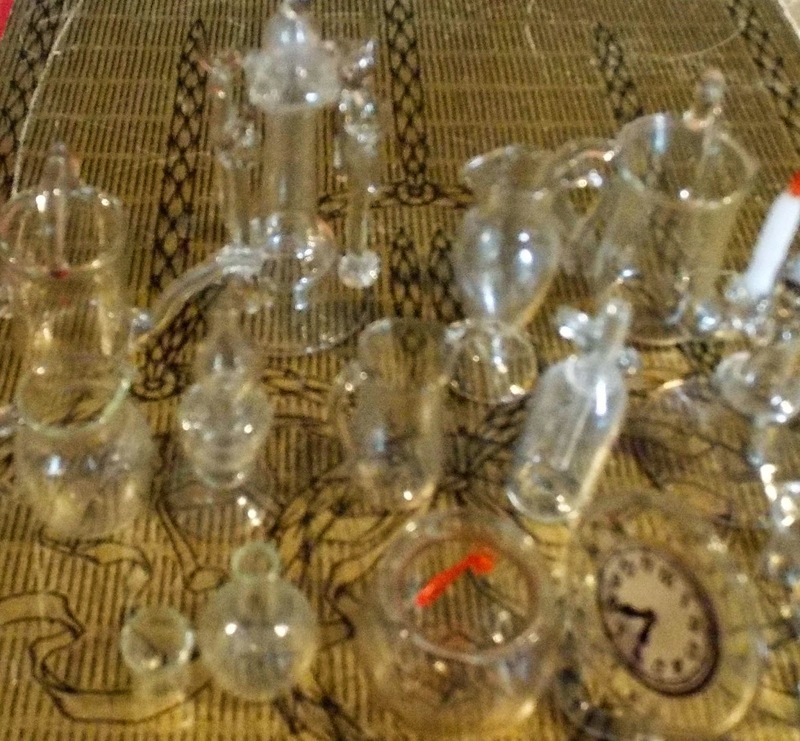 All these are quite old, maker and exact age unknown. 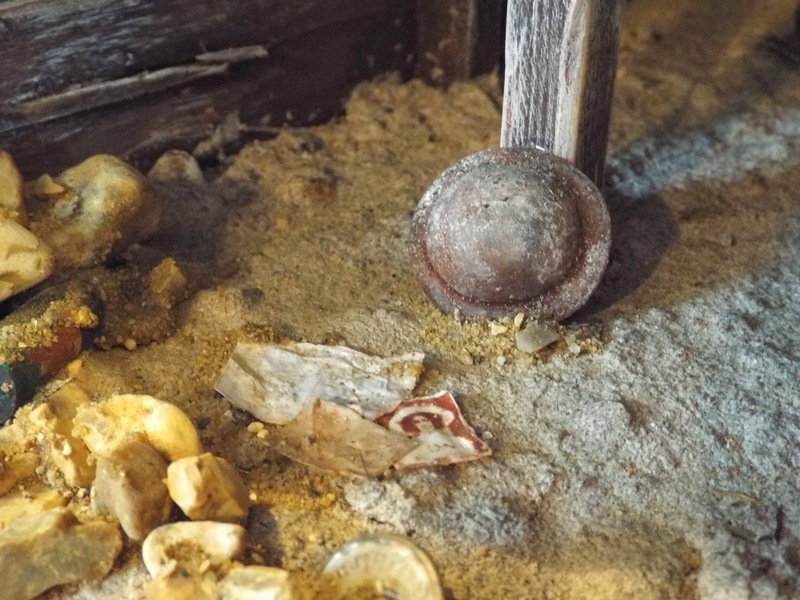 WW1 Dugout Has New Owner....Poignant Story & So Very Apt! 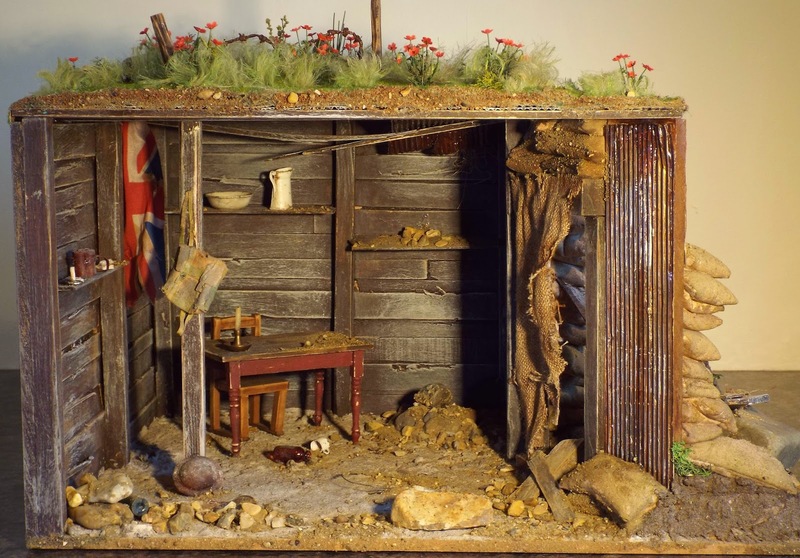 Followers of KT Miniatures and the Nostalgia In Miniature Workshop website, plus readers of the Dolls House & Miniatures Scene Magazine, will be familiar with our now much travelled WW1 Dugout, Trench & Poppy Field Scene. When I say "our"...I mean of course my workshop colleague Robin Britton and myself. However, we are delighted to announce that a lady from Hertfordshire (UK) offered an amazing £400 for the purchase of this little scene, which was well in excess of what was being asked and needless to say the offer was accepted! Readers of the magazine may remember that the little WW1 project was featured as a "how to make" project over three months. 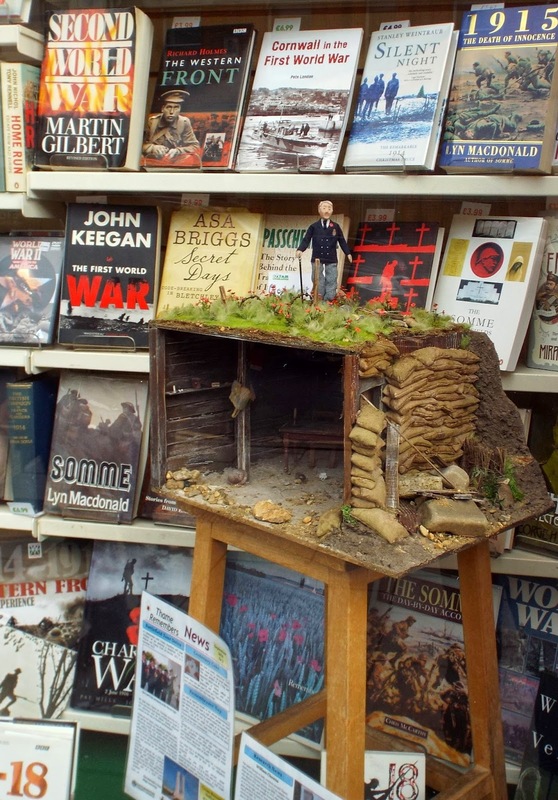 Plus it has been on display at Thame Museum as part of their WW1 Centenary Exhibition and at Miniatura in Birmingham. Finally....as from today it is in the window of the Oxfam Bookshop in Thame High Street for Armistice Day and will then embark on its final journey to the new owner. 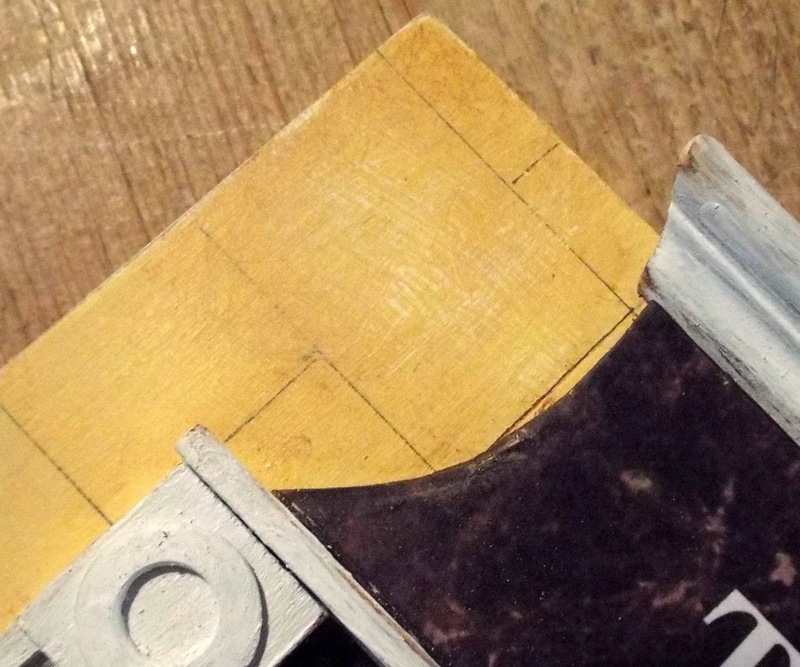 Actually, over the past few months, both Robin and I have been receiving some wonderful emails from various people all over the world with regards to this project, and we are looking forward very much to seeing some of those finished miniature dugouts that many of you are creating! This little scene will be going to its new home very shortly...and the new owner has a wonderful poignant story to tell. Although she would like to remain anonymous, she has generously allowed us to share her story and given us permission to use the amazing photo of her grandfather, seen below. 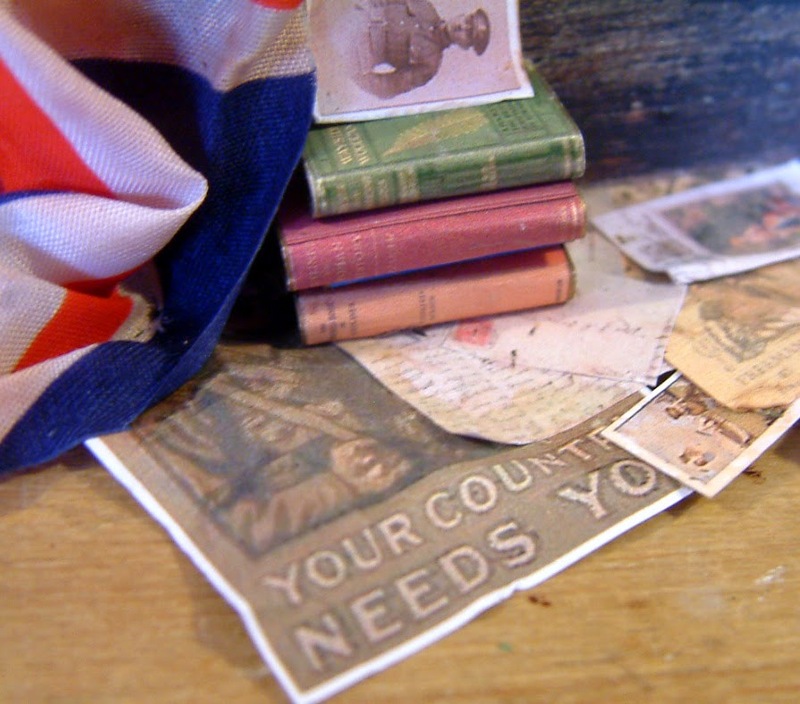 The lady in question said that she had greatly admired our WW1 scene along with the accompanying video on our workshop website (which we have featured once more further down this posting), and had felt that it was so evocative of those awful times. She then went on to tell a fascinating story about how a few years ago, her family inherited some letters from her grandfather that had been kept safe in his old farm ever since WW1 by his niece, who is now a grand 91 years old! 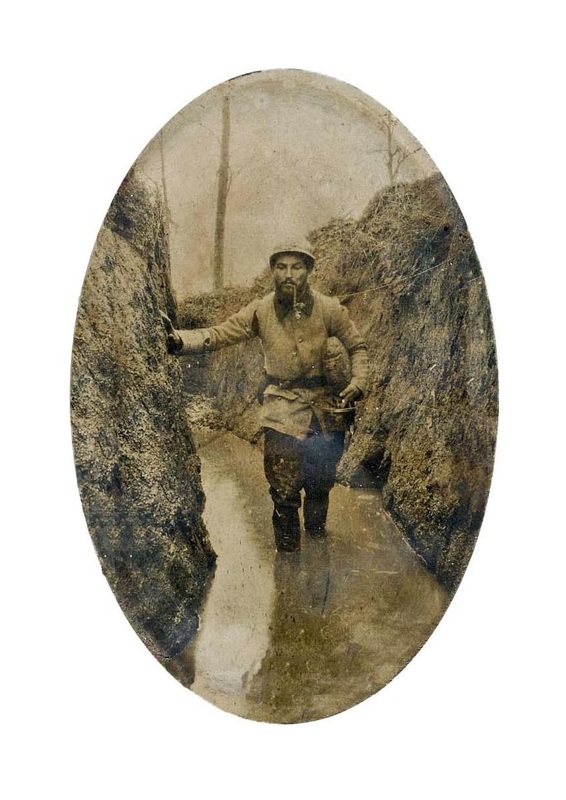 He was one of two brothers in the French Army, and they both looked out for each other during the war. Her grandfather, seen in the fascinating photo above, was an engineer so his letters were quite detailed about the villages, the landscapes and the different movements of troops at that time. Being a photographer too, he was sent out as a scout at night to survey the paths to be used by the canons the next day. He was also in charge of "communications", a glamorous word for carrying around everywhere a wind-up telephone, and was quite a character by all accounts! Both brothers survived the war itself, but her grandfather's brother sadly was gassed during the conflict and suffered badly until his death in 1951. Her grandfather died in 1936, in a motorbike accident. As a final footnote to this story.....the lady's brother organised an exhibition in the little town where her grandfather lived - just west of Paris, earlier in 2014 as part of the WW1 Centenary commemorations. The exhibition followed the destiny of four soldiers from the same area, including photos, medals etc. and an itinerary was created following the first four days of the war in 1914 in Belgium, based on her grandfather's letters. To experience the full impact of this video, we recommend you turn your speakers on and view in full screen. Labels: Nostalgia In Miniature Workshops WW1 Dugout, Trench And Poppy Field Scene. 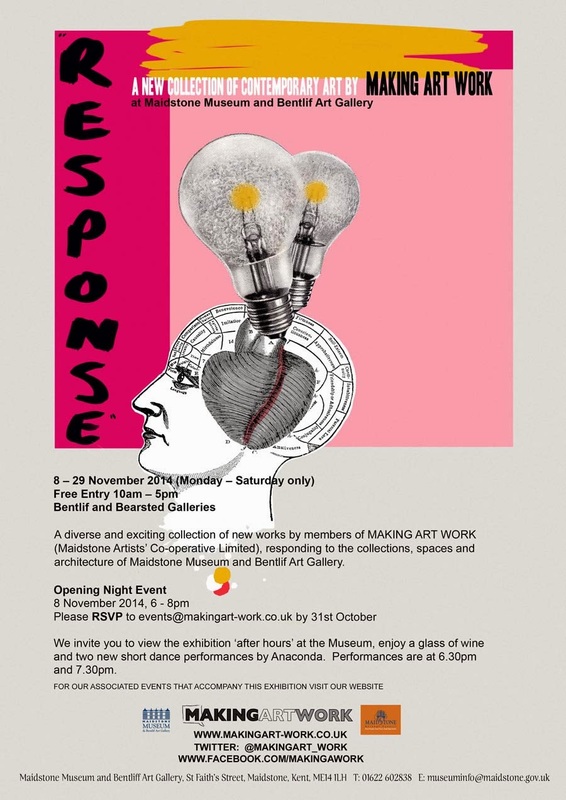 Artist Veronica Tonge has sent me information of yet another exhibition that she is involved in....again in Maidstone, Kent (UK). Below is the official flyer of the exhibition, then further down you can see some photos and information specifically about Veronica's fascinating work. Here are the two doll's houses that Veronica used to make a two part art work "Authenticity: Ambiguous Belief" for Making Art Work's RESPONSE exhibition at Maidstone Museum, on show from the 8th - 29th November. "The concept is that these houses, an Amersham of the early 1950s and a Tri-ang of the 1970s, have been offered to the museum as a donation and said to be owned from new by the same family. They are presumed to be "authentic" but are they really what they are said to be, because in reality they have a hidden history? The remains of the Amersham was rescued by someone (not me!) and the missing base and garage replicated. The previous owner had painstakingly removed the modern makeover to reveal traces of the original Amersham papers, and painted foliage on the front and also had some replicas papers made. The Tri-ang 50 was bought by me from a charity shop with 1970s illustrations stuck onto the outside by a child and the tin front completely overpainted with white gloss. Inside another child had fairly recently stuck yet more bits of magazines onto the rooms. 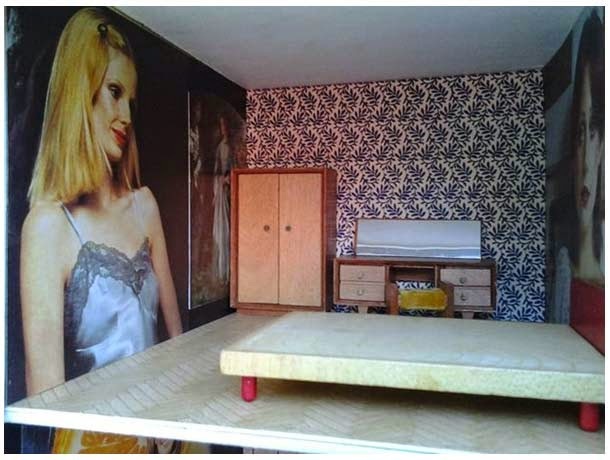 I decided to cover the interiors with genuine "authentic" papers from a stash I bought in the 1970s, adding some illustrations from a 1970s Woman's Weekly and a Golden Hands. Barton/Lundby bits from my collection and a set of Tri-ang decals (kindly provided by Trevor Cain) completed the artist's version of the authentic 1970s house. The idea behind my work is "what exactly is authenticity?" 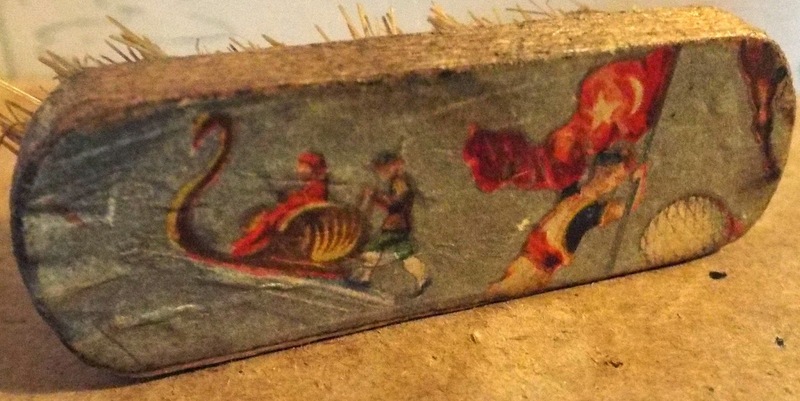 Using aging techniques (a sort of forgery that museums understand) often happens when a museum object is conserved (you almost never can tell when an object has been repaired) is a form of authenticity - according to the dictionary definition above. 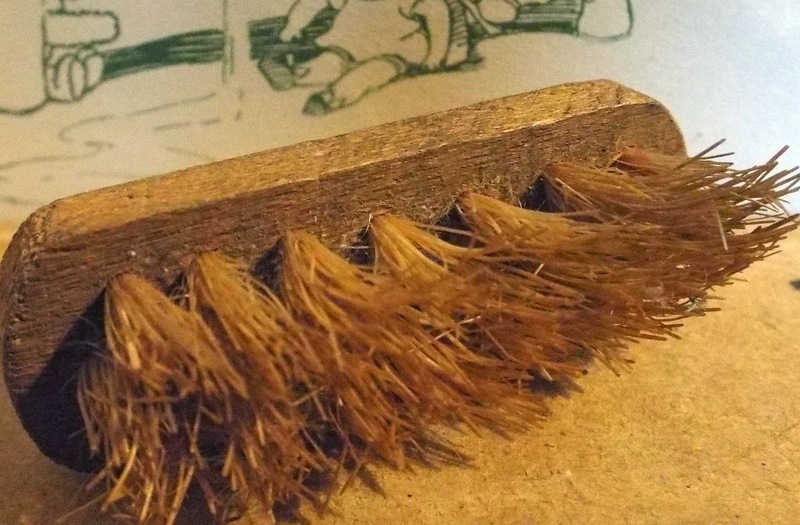 Designating a found object as an art work by altering it slightly, was routinely practiced by the Surrealist artists of the early 20th Century and so, hey presto, you have an authentic, new work of art. 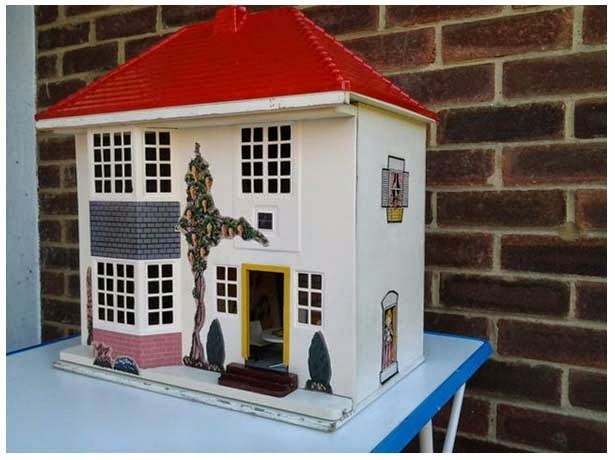 My doll's houses were a response to the doll's houses in Maidstone Musuem's collection, and I hope that my art work for this exhibition will help to draw attention to them and help them to be seen as valuable social history records, as well as historic toys." This is a fascinating concept.....hope some of you can get to see this exhibition. Labels: Autenticity-Ambitious Belief, Exhibition Maidstone Museum, Veronica Tonge.